In early spring I noticed an unusual plant starting to grow from the bottom of my pond and eventually float on the surface like a patch of Monet’s water lilies without the lilies. My wife was so taken with this mysterious underwater landscape that she rushed to get the camera to photograph it. The iridescent lime green color of the algae seemed so exotic at first, like something from the tropics. By midsummer the initially beautiful floating landscape looked more like the set of a bad 1970s science fiction film. “Pond scum” had rapidly taken over the pond. The blob-like mass started at the warmer edges of the pond and, bolstered by these perfect conditions, spread to the center, covering about a third of the surface by summer’s end. 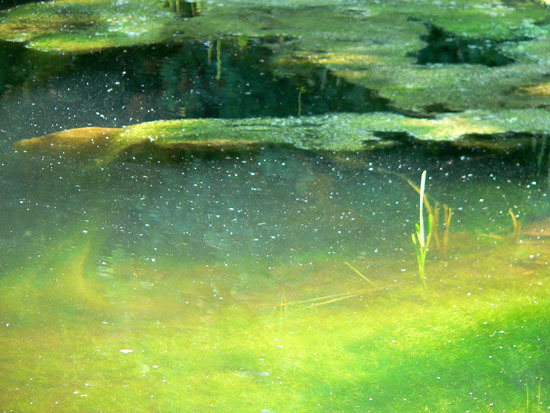 Pond scum is the common term for aquatic algae, which tends to “bloom” or grow at rapid speed in the early months of spring into summer. These are ancient plants that evoke the beginning of time, with no true roots, stems or leaves. There are thousand of species of aquatic algae, but they can be classified in three categories: microscopic algae, attached-erect algae, and filamentous algae. Attached-erect algae, often called stonewort or muskgrass, is often mistaken for pond plants because its leaf-like structure grows along a stem-like structure. Though this form is less common, it is problematic because the submerged attached–erect algae can interfere with a swimmer’s progress. 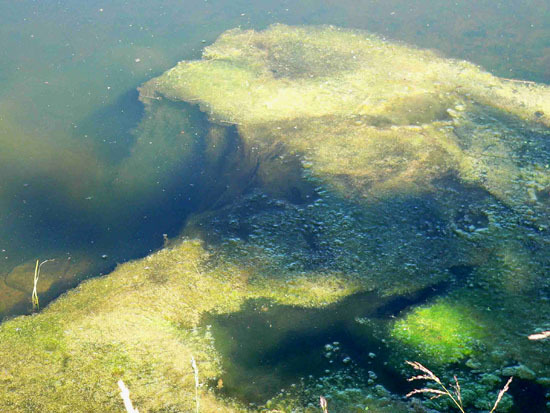 Green filamentous algae is the most common and most difficult algae for pond owners. Needless to say, this is the variety that has taken over my pond. The fur-like clumps grow from the bottom of the pond and edges, breaking off and floating to the surface to form dense mats. Many species of filamentous algae are cold-tolerant and begin blooming very early in the season. It’s easy to recognize because the algal cells join together in long strands that look like green hair. Upon discovering the algae last summer, my two young nephews attacked the adults present with large wet clumps of the stuff, hurled amid cries of sadistic excitement. I let them behave like monsters because I reckoned they were cleaning the pond, and I couldn’t control them anyway. Depressingly, the algae they removed seemed to be replaced within days. My pond, dug about three years ago, is about 50x75x16 feet deep. The freshly dug hole was full after a week of rain. Tadpoles, newts and all sorts of aquatic life appeared, followed by dragonflies, diving beetles and water boatman. I was amazed at the speed at which these living creatures just moved in and took up permanent residence both in and near the pond. The second year there were a million frogs and their jazzy chorus would keep me up at night. I have since gotten used to and even fond of their varied nightly crescendo. The bird life, too, became more diverse as water-loving birds started to show interest in this new body of water. A strange brown speckled neck-less bird sat up in the poplar tree, and when my back was turned was “vacuuming” up the frogs along the pond’s edge like a great whale eating plankton. The American bittern is a stocky brown heron with warm brown-colored feathers and yellowish blunt bill. There were also killdeer, swallows, and several species of ducks including mallard, and the common merganser. The dreaded blue heron, a wily hunter, started showing up once I stocked the pond with 50 little brook trout. During a torrential rainstorm I happened to see him swipe a foot-long trout out of the pond. Running out of the house like a banshee, I scared him off and he dropped the fish at the pond’s edge. I threw the fish back into the pond and it swam away apparently unharmed by the incident. In the summer months at dusk my wife and I will go out to the pond and sit on the jetty watching the trout jump for insects that hover just above the surface. It’s one of the few times we get to see the fish as they prefer to live in the cooler depths. Each season the pond changed in some subtle and not so subtle ways. For two years the new pond remained a cloudy clay color. And then early in the third spring the water cleared and it had that sparkling quality that beckons the swimmer. Those first two summers the water level dropped a foot or more in July and August, but this last year the pond silt had settled and the water level did not drop at all. Several varieties of water grasses and sedges appeared the second and third years softening the edge of the pond, as if it had always been there. Bulrushes were also beginning to sprout up but we have been vigilant about removing them each year. If left unchecked they would overtake the pond in a season. My wife calls herself the bulrush police and the burdock police, but that’s another story. The algae problem seemed to be the latest phase of my pond’s life cycle. The pond has been the most fulfilling project I have undertaken in the garden. I appreciate it because it is its own living organism and up until now has not required much of me but has given me so much in return. The solution for this new intruder scum, therefore, needed to be a safe and natural one that would do no harm to all the precious life that had graced our pond. Since the Middle Ages farmers have used straw to keep their ponds clear. Barley is the preferred straw to use because it does not break down quickly. I saw barley straw for sale in one of my garden catalogues and foolishly bought a 50 foot strip that floats on the pond’s surface; the cotton, woven strip of straw cost $60 including shipping. I used this for a client’s very small pond and within two months there were no algae whatsoever. I have since discovered that entire bales of barley straw are commonly available at nurseries and feed-and-seed stores and the prices can vary considerably, ranging from $16 to $40 for one bale. It is recommended to use mesh sacks, such as a large onion sack. Loosely fill the bags with the straw and anchor them to the pond’s edge so that the bag floats. It’s important to have the straw placed loosely in the bag because you want the water to flow through the straw. Place several of the floating bags around the pond to work on the different areas and be sure to anchor the bags to the shore. Lignin ― the starchy material that makes straw stiff ― begins to break down when it is rotting under well-oxygenated conditions with adequate sunlight. Do not throw the whole bale into your pond because the barley is less effective if it sinks. Hydrogen peroxide is produced by the rotting straw and will continue until the decomposition process is complete. Once the barley straw becomes active it usually takes four to six weeks depending on how bad the conditions are. The straw will continue breaking down for six months. I have read that two bales are required per acre of water. It is also recommended to stop mowing around the edges of the pond. Creating a buffer strip of unmowed area at least 3 feet wide will keep the nitrogen of the decomposing grass from running off into the pond. Lawn fertilizers contain nitrogen that feed the algae and speed up its growth. A friend of mine, who has had a pond for 25 years or more, tried the barley straw several years ago and has had success. He has never had a problem since he tried this natural treatment. As I drive around the Catskills, I see a lot of ponds completely covered with algae. I hope word gets around that there is a safe, natural solution and it is not too costly. Enjoy summer, and happy swimming.